WONG SU JEAN age 12 years student of SJK[C] Chee Wen of Subang Jaya has taken the first step to becoming an internationally recognized artist by winning the local competition jointly organised by the Lions Club PJ Mutiara & Leo Club of Monash University Malaysia. Out of all the posters created by the 40 participants, Wong’s poster was selected by judges Ms Anne Law Chi Ying, Ms. Jade Tan Wuan Yean & Mdm. Goh Wan Leng for its originality, artistic merit and best portrayal of the contest theme “Vision of Peace”. Judges & Members were impressed by the amount of effort exhibited & creativity expressed by the participants. It’s obvious that these young students have strong ideas of what peace means to them and we are proud that we were able to provide them with the opportunity to share their vision with all of us. Our club is cheering for Wong Su Jean as her poster advances in the competition and we hope that her vision will ultimately be shared with others around the world. We are also pleased to announce the 1st runner-up went to 11-year old Mindy Yap Minyi of SJK[C] Mun Yee, Kuala Lumpur & 2nd runner-up went to 13 year old Chong Pui San of SMK Pandan Indah, Kuala Lumpur. Prizes were awarded to 10 merit and 11 consolation all given out by President Lynda Yeng witnessed by R7C Nelson Wong and 9 members. 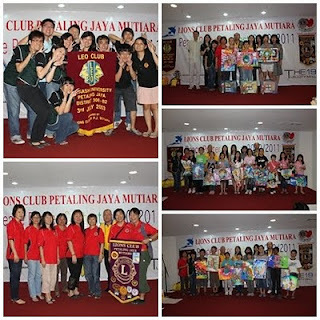 This year, the Peace Poster Annual event has been made possible by the generous sponsorship by management of The 19 USJ City Mall Sdn Bhd as venue sponsor, 02 Plus Sdn Bhd for 400 bottles oxygen water, Soong Wing Kwong & Sons Sdn for watches and host of individual donors namely Ms. Chan Wan Moi, Ms. Loo Poh Kheng, Mr. Kai Goh, Ms. Jackie Choong, Mr. Ng Fook Chong, Mr. Tan, Mr. KC Lim, Mr. Jeff Moe , Mr. Victor Teh & Lion Soong Kok Hoong , all totaling RM1,900.00 sourced by OC Jennifer Choong. 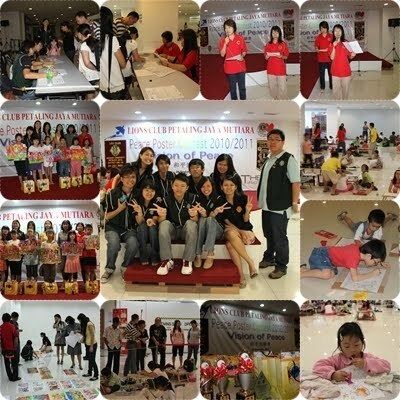 Concurrently with the Peace Poster Contest, the 11 Monash Leos superbly handled the coloring contest very well for both category, for children aged 5 to 7 and 8 to 10 years. Prizes were given out by Leo President Lee Ann June witnessed by Leo OC Choy Sook Yan. 16/09/2010 VISIT CHONG SISTERS AND CHOONG BROTHERS. In conjunction with Mid-Autumn Festival, members decided to visit the Chong Sisters with their Aunt & Choong Brothers with their mother. 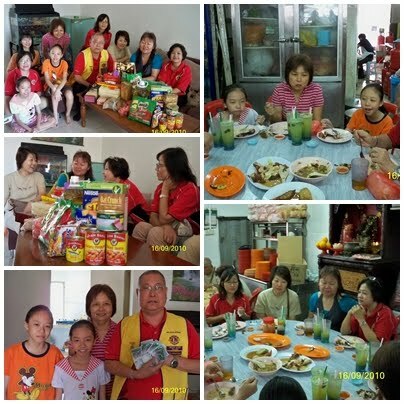 Led by OC Irene with members Nelson, Nancy, Jamie, Josephine, Poh Ling, Chwee Chin and Jennifer they arrived at the Chong sisters rented room at 10.15am with our RM200 groceries. After chatting with the Aunt, members decided to donate additional RM300 to assist in settling the rental. Members took them for lunch thereafter. 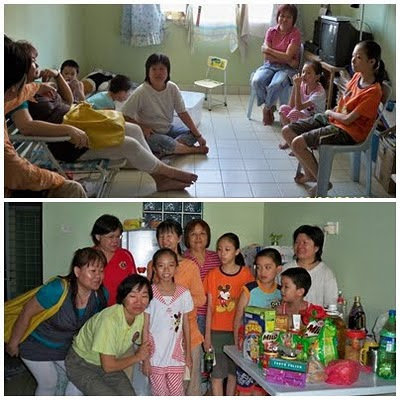 After lunch, members adjourned to the Choong brothers low cost apartment at Bandar Tasik Selatan, KL. They were delighted to see members and the Chong sisters and Aunt. Members handed over RM200 groceries here too. 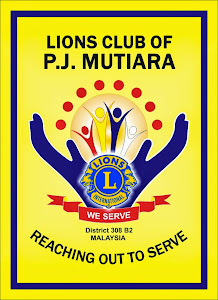 Vote of thanks to Lion Wee May for sponsoring the mooncakes for both families. 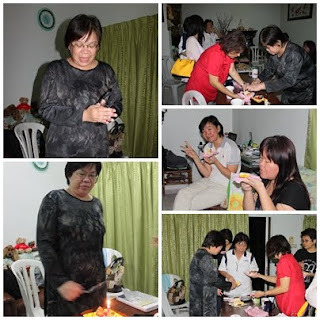 Celebrated Lion Nancy's birthday at our 5th Business Meeting held on 3 Sept 2010.